Using a router is the easiest way to connect multiple devices to the wired network at one time. If you are following these instructions on a laptop, find your computer's wireless switch and turn it to the 'off' position. This will force your computer to use the wired network connection. Start these instructions with your router powered off. Do not power on your router until instructed to do so. Connect one end of an network cable to the the WAN or Internet port on the back of your router, and the other end of the network cable to the wall jack in your room. Make sure you don't accidentally connect to the telephone jack! The placement and appearance of data jacks varies from building to building. In general, the data jack is labeled "DATA", may be yellow or gray in color, and is located at the bottom of the faceplate. If one jack does not work, try one of the others to be sure. Connect a network cable from one of the LAN ports on the back of your router to your computer's network port. Connect power to your router. Enter your Georgia Tech username and password, and select Register This Device. Enter a brief description of your router, such as "George's Router". If you want to run a web server or want to host online games from behind your router, check the Disable Inbound Server Security (ISS) checkbox. Note: If you are going to register multiple devices, only one device can have ISS disabled. Disabling ISS will disable the border firewall for this device, and will assign a "static" IP address. Click I Accept Responsibility for this Device - Continue Registration. You should see a confirmation screen. Unplug your router from power for five (5) minutes. After five minutes have passed, your router and any devices connected behind it should now be able to connect to the internet. When looking to purchase a router for use during your stay at Georgia Tech, there are two things you should consider - the router's speed and its wireless radio. Georgia Tech's wired network can reach speeds exceeding 500 Mbps, and in order to take advantage of that speed, your router must be fast as well. Look for something in the router's description that looks like "1000 Mbps" or "Gigabit" for the "WAN" or "Internet" and "LAN" ports. Additionally, any router you purchase must either not have a wireless radio, or have the option of disabling the wireless radio. For the sake of keeping the Georgia Tech network secure, OIT's Cyber Security Policy prohibits residents from broadcasting their own personal wireless networks. If you do not disable your wireless radio, you are at risk of having your internet disabled. We have identified the following routers as being gigabit-capable and as being able to have their wireless radios disabled to comply with OIT policies. If purchased, our staff will be happy to assist in the initial setup and disabling of wireless radios if desired upon submission of a help request. *Prices retrieved from Amazon in February 2017, are subject to change, and will vary between vendors. If you already have a router or would like to purchase a router not listed above, feel free to submit a help request or send us an email with the manufacturer and model number of the router. We can verify that it has the appropriate specifications to comply with OIT policies and get you the maximum speeds on the Georgia Tech network. 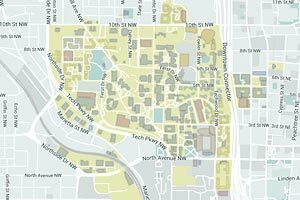 Georgia Tech's wired network allows up to five (5) registered connections per student resident. However, only one can be connected in your dorm room at a time. If you want to connect multiple devices to the Ethernet port in your room simultaneously, you will need to use a router. OIT policy explicitly prohibits the use of the wireless broadcasting function of routers. If you wish to use a router in your room, ensure that the wireless or radio broadcasting feature is turned OFF. Violators are at risk of having their internet privileges disabled by OIT. If your internet has been disabled, please follow the instructions that you received in your email notifying you of your policy violation. If you can't find a notification email, please submit a help request and we would be happy to assist further. The use of switches, hubs, and/or splitters to connect multiple devices to a single network port in a residence hall is prohibited. If you attempt to utilize one of these devices on the wired network, you may experience intermittent or total loss of network connectivity for all connected devices. Please utilize a router with all wireless features disabled, as listed above, to connect multiple devices to a single port in your room.